Through the 'Nimoy Network' that is firmly established across the country, I heard well in advance of "Vincent" coming to Atlanta and immediately decided to go. Even though I had already seen "Vincent" three times before (1979) in Washington, D.C., my friend, Cathy Willoughby, and I ordered tickets to five performances over the weekend of March 7-9, 1980. Cathy and I were both staff members on a psychiatric unit at our local hospital. One of our female patients was an ardent fan of Mr. Nimoy's and was quite excited about our trip. We decided to write Mr. Nimoy at the theatre to ask if we might be able to see him to get an autograph for her (and maybe for ourselves too!). Upon our arrival in Atlanta, we discovered that our hotel was directly across the street from the Peachtree Playhouse! To our dismay, we also discovered that the hotel only had our reservations for two nights and that meant that we had to find another hotel for our third night in Atlanta. Friday, March 7 - As if on cue, rain began to fall shortly before the Friday evening performance. We walked (- er -) ran to the theatre and enjoyed looking at the stills from the theatres' past productions, which included Leonard Nimoy in "Fiddler". To our delight, we discovered the Van Gogh bust on display. We examined it quite closely and found it to be a remarkable piece of work. 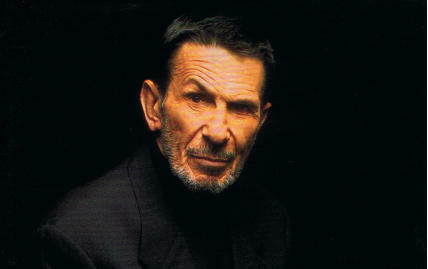 The bust had been done by Vincent Jeffers for Mr. Nimoy, and he displayed it in the Lobbies of the theaters on this tour. Mr. Nimoy, as usual, was superb and I enjoyed seeing the changes that had been Made since the earlier tour - particularly the addition of the Bizet music at the beginning of the Second Act. Knowing that his birthday was coming up, I had a gift for him with me. It was an artwork/calligraphy piece that I had conceived. A Van Gogh quote: "The best way to know life is to love many things" was surrounded by an array of pictures representing the "loves" that are part of what Mr. Nimoy is - actor, writer, director, poet, photographer, lecturer, student, recording artist, pilot, son, husband and father. I had the framed work with me that night and Cathy said that I had better give it to him while I had the chance. Once again, I edged towards him and when he turned around I said, "Excuse me - I just wanted to give you an early birthday gift" and I brought out the picture. His whole face lit up and he took it in both hands while I explained the various pictures to him. His "aides" who had been standing around began craning their necks to see it too. He laughed when I finished going over it and said, "It's an excellent piece of work, thank you so much." He then turned to a gentlemen beside him and said, "Please take good care of this," and smiled back at me as he moved on. At this point, Cathy asked for an autograph and during the course of their conversation she told Mr. Nimoy how much we enjoyed the play and mentioned that we'd be seeing all of the remaining shows that weekend. After we were through talking, another gentleman who had been standing nearby approached us and asked (in a charming accent). "Are you the two who wrote the letter?" We admitted that we had sent a letter to the theatre. The gentleman, Eric Harrison*, nodded and said, "We (indicating Mr. Nimoy) read it and I believe we may be able to arrange something for tomorrow night to get your autographs." Talk about being thrilled - we could hardly believe that our letter had actually gotten to him! Saturday, March 8 - We arrived early at the theatre the next afternoon for the matinee. While sitting in the lobby, we could hear a number of phone conversations concerning people who wanted tickets, but were informed that all of the shows had been sold out. We saw a number of people who then proceeded to buy SRO tickets - we were glad we had ordered ours well in advance. A young man whom we had seen earlier came by and, seeing us, asked if we had been there the night before. When we said yes, he introduced himself as Pete Robinson, the House Manager of the Peachtree Playhouse. He wanted to know if we were seeing the show again. He was quite surprised to hear that we had come from North Carolina to see the play several times. Smiling, he said, "You are what I'd call real fans!" To our surprise, he sat down and began telling us how impressed he was with Mr. Nimoy and how he was enjoying working with him. He said, "I've worked with a lot of actors here and, in my opinion, Leonard Nimoy is one of the best - it's a shame more people don't know him for the fine all around performer that he is." Of course, we agreed! After a lengthy and delightful discussion about Mr. Nimoy, Mr. Robinson excused himself to attend to some business before the matinee began. After another fine performance, Cathy and I decided to just wait in the lobby until the evening show as it was only a few hours away and we really didn't have time to go anywhere else. We bought a soft drink and some candy then sat down on the sofas in the lobby to eat our "supper". Mr. Robinson walked by again and we talked briefly. After he left, another young man came through the lobby. He stopped and laughingly asked us if we had come this early for the evening show. We told him that we had been to the matinee and just decided to wait here for the next show, "You're kidding!" was his response and he immediately sat down and introduced himself as Scott Horner, the electrician on the "Vincent" crew! We told him about our trip and about talking to Mr. Nimoy the night before, as well as our conversation with Eric Harrison. Mr. Horner laughed and said that Mr. Harrison must have been pretty impressed with us to make such an overture. We had a wonderful conversation and he told us about how fascinating and energetic Mr. Nimoy is to work with and know. He also spoke of the Nimoy's "beautiful home" and how "quiet and intelligent" Sandi Nimoy seemed to him. I asked him if Julie and Adam were with them and he said, "Who?" Then, really laughing, he said, "Oh! His kids! You really know a lot about him don't you?" He said that they were not in Atlanta but may join them in San Francisco. I asked then if he had seen the picture I had given Mr. Nimoy the night before and he said, "You did that? Sure, I've seen it - it's up in his dressing room!" (Wow!) He asked what the picture of Alaska represented and I told him that Mrs. Nimoy was born in Alaska. He really looked puzzled then and said, "I believe you know more about Leonard than I do and I work with him!" We all had a good laugh over that! During the course of the conversation, I mentioned the LNAF and Mr. Horner was immediately fascinated: "I have not heard about that - is it a Star Trek club?" I informed him that it was what the title implied - a Leonard Nimoy club and that its membership was in the thousands. He shook his head in amazement as he got up to leave and said, "I'll certainly have to talk to him about it!" Following another well-received performance, Cathy and I made our way to the stage door. It had not been mentioned this night that Mr. Nimoy would be signing autographs in the lobby, as we figured that this would be the best place to go. Mr. Robinson came by and told the dozen or so people who were waiting that Mr. Nimoy would not be coming out for autographs as he had a late dinner engagement. Everyone eventually disappeared except us - we were hoping that Mr. Harrison remembered his promise. About twenty minutes later, a car pulled up and the "Vincent" crew came out. Mr. Horner waved as he and the others piled in the car and drove off. Mr. Nimoy and Mr. Harrison were not in this group. Shortly, the car returned and the driver, a young mustached man, got out and went back inside. In a moment, Hr. Harrison did come out. He spoke with us briefly and handed us a personalized program from Mr. Nimoy to our patient. We were thrilled that he remembered her name and we immediateIy thanked Mr. Harrison and told him to thank Mr. Nimoy for us too. He looked around and said, "Are you the only ones out here?" I replied that I thought we were and he said, "Well, come on back - I'll let you thank him yourself!" As we calmly scrambled (can you do that?) through the door, we were joined by two other girls that we had seen earlier but thought had departed. Once inside, Mr. Harrison told us to wait a moment as he went to fetch Mr. Nimoy. On a nearby table sat the mustached man that had been driving the car in which the others left. He smiled and said, "You must be the ones who wrote the Letter!" Surprised, I asked jokingly, "How many people know about us anyway?" He laughed and said, "All of us read the letter and we've been waiting to see you!" Needless to say, Cathy and I were both quite shocked! At this point, Mr. Nimoy, looking a bit tired, but obviously receptive, entered with Mr. Harrison. I held up the signed program for our patient and said, "I wanted to thank you for this - she will be absolutely thrilled." Displaying that famous Nimoy smile he responded with, "You are certainly welcome - is there anything else I can do for you?" My 'cool' was immediately blown, of course, but I managed to ask for an autograph. While signing it, I asked if he still had my picture and, "Sure - you bet!" was his answer. I laughingly told him how everyone around the theatre seemed to know about us and he graciously asked us a few questions about the psychiatric unit. Cathy and I asked for an autograph for the hospital and he immediately signed a program, "To Unit 300, Best Wishes, Leonard Nimoy." The other girls, then asked for autographs and one mentioned that she was from Birmingham, Alabama. Mr. Nimoy asked her if the 'Town and Gown Repertory' was still around. (See Page 255). She replied that it was and asked when Mr. Nimoy had been there. He laughed and said, "I doubt if you saw me - it was quite a few years ago!" After thanking Mr. Nimoy for seeing us, we turned and walked back up the stairs leading outside. Although Cathy and I had had our cameras in our pocketbooks, we had decided not to ask for pictures at this time as we knew Mr. Nimoy had to be tired after such a long day. It was nice enough for him to take the time to see us! Sunday, March 9 - The next afternoon found us (again) in the Peachtree Playhouse lobby. Mr. Horner passed through and waved. A few minutes later, the mustached 'driver' we had seen the night before passed by and stopped to chat. He said his name was Mark (we think Mark Kroening the sound technician/projectionist on the "Vincent" crew). He was wearing a "Vincent" T-shirt and we talked briefly about it. I told him that I had bought one during the tour last year and we both agreed that it was unfortunate that "Vincent" items were no longer available for sale. When Mark left, we sat down to rest a moment. It had been a busy morning as we had switched hotels due to the Colony Square being full for our third night. We decided to move to the Atlanta Marriott. We barely had time to get settled before we decided to leave for the theatre. Luckily, a friend of mine who lives in Atlanta gave us a ride to the theatre (we were no longer 'just across the street'). Once there, the three of us decided to get another look at the Van Gogh bust. White we were 'oohing' and 'ahhing' I heard some movement behind us. Turning, I saw Sandi Nimoy pass through the lobby. Dressed primarily in black, with a sweater tied loosely around her shoulders, she looked very petite and striking. After plans were made to meet my friend later (she had tickets to the evening show), Cathy and I took our seats for the matinee. Again, our Mr. Nimoy played to a packed house and a standing ovation (I just love the way Mr. Nimoy places his hand over his heart in gratitude for such a response!) Once the crowd dispersed, we bought another 'cola and candy' supper and began waiting for the last show. When Pete Robinson, the House Manager, walked by this time, we told him that we did get to speak with Mr. Nimoy backstage the night before. Grinning, he said: "I was hoping you would - I left the stage door open on purpose so someone might look out and see you!" We thanked him for his thoughtfulness and he, in turn, introduced us to Glenn Gray, the Administrative Coordinator for the Peachtree Playhouse. We had a fine time talking about the theatre, Leonard Nimoy, our hometowns, Leonard Nimoy, Atlanta, Leonard Nimoy - well, you get the idea. Before we realized, it was time to be seated. We had our best seats for the weekend for this show. The performance, as expected, was flawless and there was a strange mixture of joy and sadness as I rose as part of a standing ovation. There was joy at a 'job well done, yet sadness that this would be the last time to witness it (for now!). A longer crowd was by the stage door afterwards and it wasn't long before Leonard, Sandi, Eric and the others appeared. Sandi was carrying some hang-ups in a plastic bag (the "costumes" - Mr. Nimoy 's suits) and she, along with the others went on to the waiting car. Mr. Nimoy and Eric paused at the group. When Mr. Nimoy finally turned my way, I said: "Thank you for another wonderful weekend and for doing those things for the hospital." With a smile that actually lit up that dark alley, he said: "You're welcome. I'm glad. Thank you." Seeing Mr. Harrison, I also thanked him for his cooperation. Smiling, he shook my hand and Said, "It was nice meeting you. Do drop in again sometime." Of course, Cathy and I were quite flattered. A moment later they had entered the car and Mr. Nimoy waved to everyone as they drove off. We lingered around the theatre a bit to say goodbye to Mr. Robinson. Upon spotting us, he walked over and immediately brought out his own "Vincent" program that read, "To Pete, Thanks for all your help, Leonard Nimoy." Mr. Robinson said that he had to show it to us to let us know that he was as big a fan of Mr. Nimoy as anyone! Before leaving, he hugged us and said, "If I ever became as famous as Leonard Nimoy, I'd want to have fans just like you!" Cathy and I were grateful that we were able to show so many others that admirers of Mr. Nimoy don't have to be strange or obnoxious. From the theatre, we walked over to our old hotel, the Colony Square, to get a cab to our new hotel, the Marriott. Once there, we decided to get something (finally) substantial to eat. It was late but the hotel had a nice coffee shop/restaurant that was still open, so we went on in. No sooner had we ordered than who should come in the door but Leonard, Sandi, Eric and another gentleman (Milt Cummins?)! We were shocked and just froze in our seats. They were seated two tables to the right of us - towards the back. Of course, Leonard had to take the seat that faced us and we immediately found that we were no longer hungry! Cathy and I laughed at each others' efforts to: 1. Eat food we were now not interested in eating. 2. Maintain a conversation while hoping to catch pieces of their conversation (without being nosy, of course). 3. Force ourselves not to stare or make them feel uncomfortable in any way and, 4. Decide when and how we should get up to go! Mr. Nimoy seemed to be in very good spirits as we heard him laugh heartily a number of times. We were amazed at his energy after such a demanding day. Eventually, Leonard got up again and left the restaurant for good. Eric and Sandi lingered a while longer, but then they too got up and made their way out. As they reached the door, Eric stopped, turned around and waved at us! Sandi looked at us and smiled. It was nice enough to find out that they had even noticed we were there, much less to publicly acknowledge our presence! Naturally, everyone in the place turned to us, but we didn't mind! After we waved back, they continued out of the restaurant. We waited a while to get up as we didn't want them to think we would follow them. For the same reason, we were grateful that we were already seated and had ordered when they came in. In closing, I must thank the Peachtree Playhouse staff and the "Vincent" Crew for being so wonderful during our Atlanta sojourn. Mere thanks could hardly convey our enormous gratitude to Leonard Nimoy - who's pretty wonderful himself. Reprinted (except for the photos) from the Leonard Nimoy Compendium No. 1, p. 73 - 76.